sock stash, originally uploaded by marmys. This is the torturous sight that greats me in my crafty room at the moment. I love to just steal a few minutes to sit and look at my stash - it makes me feel very happy! I cut away a bit of my cast (between the thumb and first finger) because it was annoying the crap out of me, and now i can do some knitting. It is very slow, somewhat painful knitting but at least it's knitting! I decided to knit a Thuja in Socks That Rock mediumweight because 2.75mm needles are more 'comfortable' than 2mm ones at the moment. It took about three hours of on and off knitting (not all on the same day) to get this toe-up sock to 56 stitches! The worst part is that while I am (literally) painstakingly knitting this very basic sock I can remember the feeling of meditative calm and mental freedom I used to experience while knitting and it is very frustrating (can you tell I'm not the most patient person in the world? lol). I will get over myself eventually - it's not like it's a permanent affliction for goodness skaes! That is ALL sock yarn? Geez. Your craft room is inspiring. In our new house (here in India!!!) I have a room that I am claiming as a craft room. I can't ait to get it set up!!!! Awwww....hope your hand heals soon so that you can knit properly. Ooooohhhhhh!!! 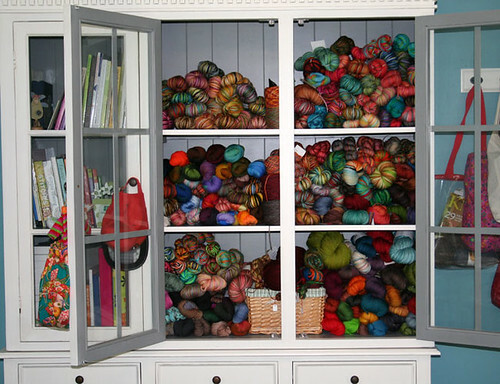 I am totally coveting your sock stash, how absolutely beautiful it looks in that cupboard too. The stash looks bigger than when I last saw it. Is there some cheating going on with the yarn diet. I am pleased there are people out there who are very jealous - I just love the gorgeous colours. With a sock stash like that, displayed so beautifully, it's no wonder you hacked into your cast to do some knitting (slow and painful as it may be). How much longer 'til the cast comes off? I hope it's soon. I'd be frustrated and impatient, too. Wow! I am so jealous. The armageddon can happen and you can happily knit socks until the end of time. I have been looking for a cupboard like that for the longest time. I just love how it displays your beautiful yarn. So jealous. I am totally in awe of your sock stash - I can only wish mine looks like that someday.